A fantastic book for teaching the letter R is Randy Riley’s Really Big Hit. Not only is there great alliteration of the “r” sound, but one of the books “main characters” is a robot! Randy Riley builds a robot and saves the world from a fast approaching out of space fireball. This books is honestly one of my favorite books because there are so many activities that you can do with it. Here is a list of my favorite Randy Riley’s Really Big Hit Activities. 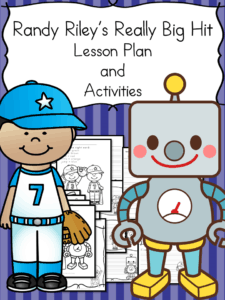 2) Make a printable robot! This is a fun cut/paste activity that goes along great with the book. 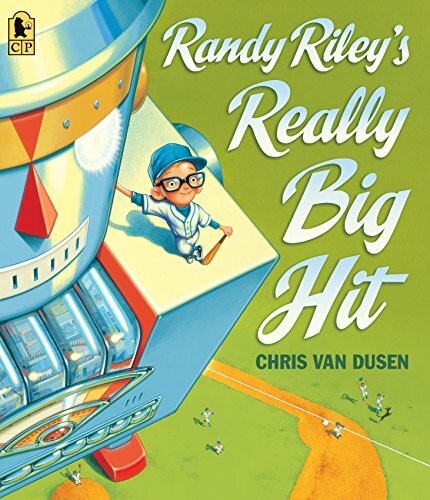 4) Play baseball – Randy’s robot hits the fireball out of the park and saves the world. You can use a paper towel roll and sock if you want to make baseball “classroom friendly”. 5) This book is great for helping students predict what may happen. Read the beginning of the book and then encourage students to guess an ending. You can even do a writing prompt where the students choose their own adventure and try to end the book. 6) Talk about how clever Randy Riley was and how he researched and worked hard to solve a problem. Think of another problem and talk through the solutions with students. For instance, what if a monster was sitting on the top of your school’s play equipment? What would you do? 7) Discuss a time when someone did not believe what you had to say. Many people don’t believe Randy, but he does not let this stop him! 8) Do a letter R Craft – this book is great for emphasizing the “r” sound….so, check out all these letter R crafts you can make! Fun Randy Riley Activity Pack!